Winnipeg Jets fans are in the midst of something that has happened to the majority of Canadian NHL teams in the past 20 years - they're in the middle of a playoff run that has as much possibility of the team making the playoffs as it does them not making the post season. Having covered and watched the Montreal Canadiens before the return of the Jets, I know very well how playoff runs that come down to the wire can go - sometimes great as when the Canadiens finished sixth last season and sometimes not so great as when the Canadiens were bounced out of the playoffs with a loss to rival Toronto in their last game of the season in 2006-07. As any hockey fan of any team that lives on the periphery of the playoff picture year in and year out - excluding Detroit for the last 20 years, Vancouver the last 10 years, and Pittsburgh the last five years - it is nerve wracking to even watch a single game because so much hangs in the balance. For the Jets this season, there have been the customary ups and downs of a young, yet talented NHL team. Not since the Quebec Nordiques shuffle to Denver have NHL fans been able to see just how difficult it is to relocate and produce winning ways. Though, the newly relocated Avalanche were stacked with some of the league's best talents - Peter Forsberg, Joe Sakic, Patrick Roy, Adam Foote - who went on to win the Stanley Cup in their first year of relocation, the Jets are not as favoured to win it as that talented group in Denver. Making the playoffs in their first season in Manitoba would be more than enough for Jets fans. Already the ticket drive for the playoffs has opened up to season ticket holders and if the season ticket drive was any indication, there will be no hesitation from fans to fill the MTS Centre with 15,004 for a guaranteed two playoff games if the Jets were to get to the second season. It's nice to talk all cheery and positive about how nice it would be if they did make the playoffs. Let's look at the facts. As of February 21st, the Jets sit tied in the final playoff spot with Toronto. They sit one point in front of third place in the Southeast Division Washington Capitals and one point behind the Division leading Florida Panthers. Both teams have two games in hand on the Jets. Both teams will making a trip to MTS Centre before the end of the regular season (Florida - March 1st, Washington - March 16th). Both teams will also host the Jets once each before the season is out (Washington - March 23rd, Florida - April 3rd). For the tangibles, Blake Wheeler is on fire with nine points in his last three games, including a four assist effort against Colorado and a three point performance against his former squad the Boston Bruins. Wheeler is finally living up to his fifth overall draft pick status in Winnipeg and has elevated everyone else's game around him. Bryan Little has two consecutive two goal games and is inching closer to the 20 goal mark for the first time since he had 31 in 2008-09. Evander Kane has 22 on the season, three more than his career high. Ondrej Pavelec has surpassed his career high in wins with 22 this season already (previous career high was 21 last season). Alexander Burmistrov has 12 goals, twice as many as his rookie season. And believe it or not, Ron Hainsey is even doing well - with a team high +10 rating. It's the right time for the Jets to have a home stand and for their top players to start getting hot. 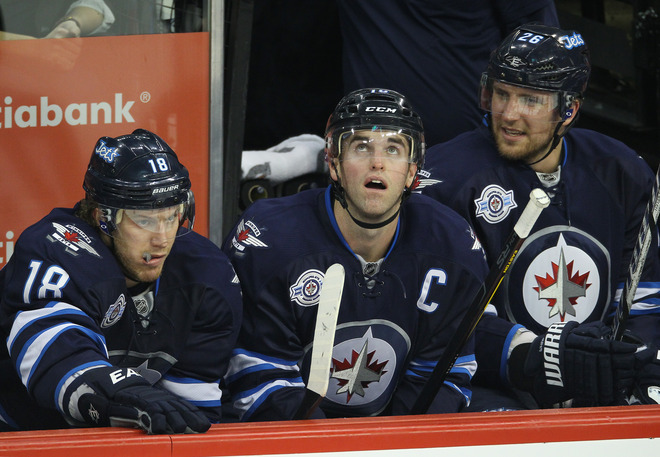 The playoff push is always an indication of what a team is made of - are Jets playoff material? I think they are even if they don't make the playoffs. This year proves how far this team has come since tanking it last season in Atlanta. And once this season is over, no one will remember Atlanta but for a distant memory.